Police reportedly released the names of the Boston Marathon attackers. Sunil Tripathi (left) and Mike Mulugeta (right) above are being connected with the attacks. State Police announced a connection between a killing at MIT and the Boston Marathon attack. Some reports are saying that Mike Mulugeta was killed in Watertown, Massachusetts. Mike Mulugeta may have attempted to use an improvised explosive device as a suicide bomb. 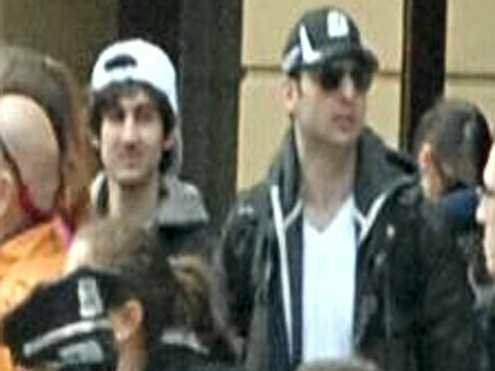 Police have identified the second Watertown suspect as "a terrorist who came here to kill people." They may have been in process of attacking MIT with additional suspects. 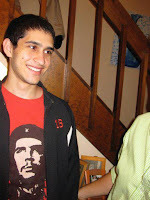 22-year-old Brown University philosophy major Sunil Tripathi, of Radnor, Pa., left his apartment at 1:33 a.m. on March 16, 20 minutes after using his computer. He did not take his personal items and left a note. "Typically, two reasons people don't take the normal things they take with them is because they're stepping outside to talk to somebody, they're going half a block away, or they're not coming back," ABC News consultant and former FBI agent Brad Garrett told "Good Morning America." His family further reported that he may have been battling depression while on leave from school. "He's been trying to figure out what he wants to do in life, where he wants to go," Ravi Tripathi, Sunil Tripathi's brother, said. On March 12 and March 15 explosions occurred in Hanover, MA. 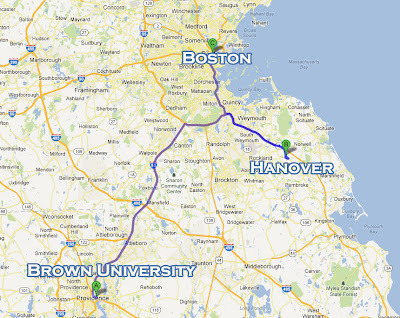 Apparently Hanover was the location of some test runs with the explosives used during the Boston Marathon. [..]two recent incidents where, over the past week, witnesses have reported explosions. Officials are concerned the explosive devices could lead to injury or property damage. The recovered explosives appear to be homemade. “We’re hoping neighbors may have seen something that may help us identify those responsible for detonating the devices,” said Hanover Fire Chief Jeff Blanchard. a jihadist announced his desire to plan bombings in the United States, but was chastised by others for revealing such a plot publicly. He is referring to a posting on the Ansar al-Mujahideen forum on April 1 in which a jihadist tried to recruit members for an attack similar in impact to al-Qaeda's 9/11 strikes, but seemed focused on the attack being a suicide bombing. Tripathi and Mulugeta, if responsible for bombings, may have been recruited, trained or inspired by Islamic terrorists. This leads to the possibility of additional suspects. Che is a popular t-shirt design for those unfamiliar with his history. Guevara is not an idol of "right wing" philosophy students. The mythical "right wing nut" remains the left's bigfoot. Gulagbound reminds us that recent domestic mass attacks have all been by progressives and drugs. 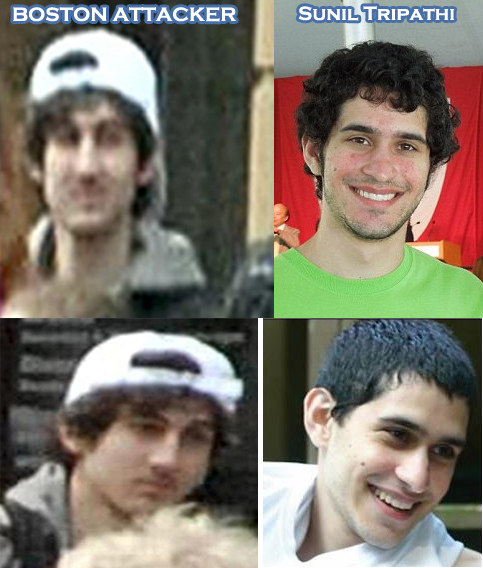 Sunil Tripathi looks nothing like bombing suspect Dzokhar Tsarnaev. Have you no shame? First, this was the available information last night. Second, we were skeptical enough to create a graphic for people to compare and also pointed out that there may be other suspects. And when was Sunil EVER seen anywhere near the finish line at the Boston Marathon? This may have been all of the information that was available at the time, but that didn't stop you at all from running with it and arriving at your own conclusion. The first paragraph linked to a story that the police published the names. This article was published at 3 am, the referenced report changed at 3:07am. There are no conclusions jumped to here, that is why we included photos of Sunil and the Boston terrorists for you to compare. Read the article.